Moist and delicious gluten-free lemon cake is layered with coconut whipped cream and fresh berries. The perfect dessert to welcome spring! Having a cold on top of allergies for the last several days hasn’t been fun, but the sun shining and the birds chirping somehow makes it a bit more bearable. The sickness started from my hubby who must’ve picked something up from work. He passed it to me and it has making its way through the family. Of course my hubby is totally better now, as I sit around with my tissues, sneezing every five minutes. It’s so not fair. On top of that he keeps reminding me that this is how he felt a few days ago…”yep, that’s exactly how I felt,” and “see, I wasn’t exaggerating.” I’m like, of course this is how you felt, you’re the one who brought the sickness into the house and infected the rest of us! Through my annoying cold, I mustered up the energy to bake and I knew exactly how I wanted to celebrate—with cake, of course! After all, this beautiful season, where everything’s in bloom and the weather has finally warmed up a bit, deserves to be celebrated! With a hint of lemon and fresh berries, I can’t think of another cake that screams spring like this one does! Enjoy! Moist and delicious gluten-free lemon cake is layered with coconut whipped cream and mixed berries. The perfect dessert to welcome spring! This cake makes two 8-inch or three 6-inch cakes. To make a 3 layer 8-inch cake, use 1½ cake recipe. Preheat oven to 325F. Grease cake pans and line the bottom with a parchment paper circle (cut to fit the bottom.) Set aside. Combine flours, baking powder, and salt in a large mixing bowl. Add softened butter, eggs, coconut oil and sweetener. Begin beating together with the flour mixture. Slowly mix in the milk, vanilla extract, and lemon zest. Scrape the bottom of the bowl to make sure all the flower is evenly incorporated. Evenly distribute cake batter into the pans and place on the middle rack in the preheated oven. Bake for 25-35 minutes OR until cake is golden brown, center is set, and a toothpick inserted near the center comes out with a few moist crumbs. Bake time will vary upon pan and thickness of batter. Remove from the oven and let cool for a bit, then run a knife along the edge of the cake (if sticking to the pan) and invert cakes onto a wire rack to cool completely. In a large mixing bowl, begin to beat the cream cheese until smooth, about 1-2 minutes. Add sweetener and lemon juice/zest and continue to beat until fluffy. Add cold, hardened coconut cream and beat on high until light and fluffy, a few more minutes. Taste and adjust sweetener or lemon flavoring. Keep refrigerated until ready to use. If using regular whipping cream, beat whipping cream separately until fluffy (about 3-4 minutes) and then fold it into the cream cheese mixture. Place one of the fully cooled cakes onto your cake plate. Top with ⅓ or ½ of the whipped cream (depending on how many cake you have) and about 1 cup of sliced berries. Top with another cake layer and repeat the process. At the end, top cake with remaining whipped cream and a pile of whole and halved berries. Decorate with edible flowers and a light dusting of powdered sugar (optional). Serve right away and store leftovers in an airtight container in the fridge. *If you need to substitute almond flour, use the cake in this recipe. Just add the lemon zest from this recipe to keep the lemon flavor. This site contains affiliate links. If you click on a link and purchase an item, I may receive a small commission on your purchase. It doesn’t affect the cost of the product at all and gives me the ability to pay for and maintain this blog. I never link to products I wouldn’t use myself. Thank you so much for your support! This is awesome!! Mouth watering! i had to make homepage for school and now i’m looking for pictures so i can make my homepage look pretty and cool! Such a GORGEOUS cake! My husband was actually just requesting a cake like this one, so I’ll definitely have to keep this in mind for this summer 🙂 Can’t WAIT to try! Aw thank you sweet friend! I hope you’re doing well! Have a wonderful week! This cake looks delicious!!! 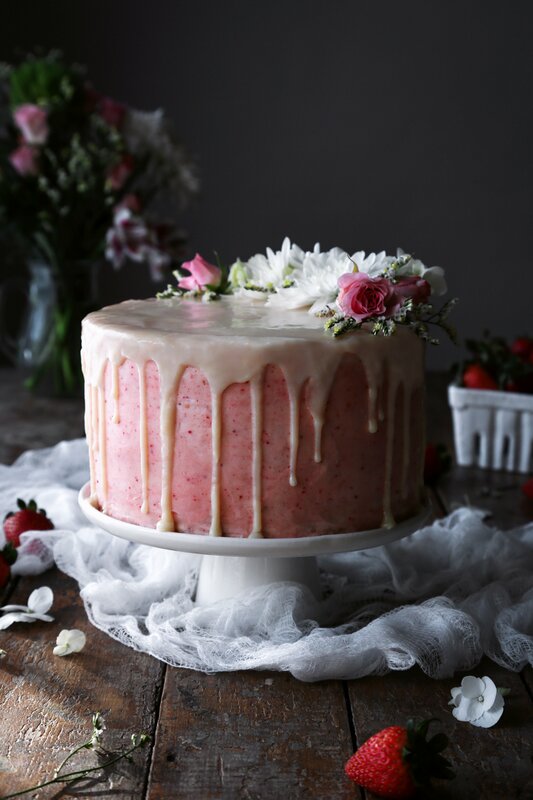 I saw your vegan vanilla cake with strawberry buttercream and I want to use the strawberry buttercream and the lemon cake recipe from this page. I was wondering if this recipe could be used to make two 9-inch cakes, instead of three 8-inch cakes? Thank-you! Hi Solange! Thank you very much! You can use two 9-inch pans, but there will likely be a little extra batter left over. You can probably make a few cupcakes or a small sample cake to enjoy aside from the main cake. Let me know how it goes!! Enjoy! I’m so happy you enjoyed the cake, Solange! Adding lemon flavor to the vanilla cake is very delicious idea, especially in combination with strawberry buttercream! I may just have to go and recreate that cake for myself this weekend!! Thanks for stopping back by to let me know how it turned out for you too!! Have a wonderful weekend! Hi there! What kind of flowers did you use? Hi Cali! The white flowers are strawberry blossoms and the purple were some flower I picked up at my local organic nursery. Some of the others I like to use though, that are also edible, are pansies, violas, and micro dianthus. Hope that helps! I love your yummy recipes Joscelyn! I just tried to make your cake and all seemed fine when I took it out of oven. However, it “collapsed” shortly after. Any idea why would that happen? I followed your recipe exactly. Hi Ilona, thank you for the sweet compliment! Sorry that happened to your cake! I sometimes find that gluten-free cakes will shrink slightly after coming out of the oven, unlike the ones I make that use regular all-purpose flour, which often have a dome. I’ve experimented in the past with adding less liquid, which helps it dome better, but it was a little too dry for my liking. I prefer a very moist cake, even if it shrinks a little 😉 Now, if it collapsed a lot, then it’s possible it wasn’t fully cooked in the center or that too much liquid/not enough flour was added. If you can give me a little more detail, I’ll try and help you troubleshoot what could’ve went wrong! What can you substitute the almond flour for?? Hi Sarah! Since almond flour has a lot of moisture and fat, it’s hard to substitute 1 for 1 without further changing the recipe. You can use the yellow cake from one of these recipes, which has regular flour or gf flour with a little coconut flour (http://www.wifemamafoodie.com/white-chocolate-summer-berry-cake-2/ OR http://www.wifemamafoodie.com/vegan-vanilla-cake-with-strawberry-buttercream/) and then you’d just add the lemon zest from this recipe. Please let me know how it turns out! Lemon is my favorite flavor, so this is right up my alley! Thank you! I love lemon too, especially combined with berries with a side of good coffee. You are just Awesome! I think you make the most delicious cakes Joscelyn. I just cannot hold my mouth from watering on each and every recipe you make. Pinning of course! Yumm!! This looks so beautiful and delicious!! These are so gorgeous. I love this lemon layer cake. I would have never thought to put berries in the layers, but it looks sooo good. Thank you for pinning and for the love, Bea! I really appreciate the encouragement! This cake is absolutely stunning! I can’t imagine how delicious it must be. Definitely filing this one away to try out in the future! Thank you, Molly! The cake is so good. I hope you try it out and let me know how you like it. Aw, thanks Clare! I hope you’re having a great day! Looks so tempting. Love strawberries. It looks too perfect to eat!! wow! I may have to try this in the summer, it looks refreshing. This looks devine! Your photos are always beautiful. I love how light and fresh this recipe is! Thank you, Laura. I hope you’re having a great week! This looks really delicious. Can’t wait to try it! Thanks Danielle! Have a lovely evening! This looks like ART, never mind food! Beautiful cakes – love your photography! I am pinning this for later, hoping I can tackle one of these someday. Thanks for pinning and for your kind words 🙂 I hope you’re having a wonderful week! This is INSANELY beautiful and looks so delicious!! I absolutely love lemon and berries – can’t wait to make this this summer and literally stick my face in it, haha! Lol, I love this! What a fun comment! I think it’s a great idea! Haha! OMG this is perfect!!! I wish I can tap it and it can appear right on a plate in front of me. Thanks for sharing. Thank you Jewels! I hope you have a great week! This cake is STUNNING. I especially love the close-up shot of the cake. Your photography is amazing, Joscelyn! Hope you get better soon! Ohh wow this looks so yummy and it’s absolutely beautifully decorated. I have the hardest time making cakes look nice. I guess I just need to practice! What a beautiful cake! I couldn’t help pinning it! The pictures are amazing!!! My husband LOVES anything lemon so this is getting Pinned! The edible flowers put it over the top (in a good way!) for company. Soooo pretty. This cake is absolutely breath taking. I would like a big fat slice in front of my mouth, RIGHT NOW! This looks really good and, like you said, perfect for spring! I hope you’re feeling better soon. This cake looks DELICIOUS!!! Baking is not something I do often, but I should because I love desserts. Then again I might eat it all in a day or two, lol! WOW!! This looks delicious and perfect for spring and Easter 🙂 Thank you for sharing! !